Another instalment in Kate Atkinson's Jackson Brodie series, this is, like its predecessors, a twist on the crime novel. Jackson Brodie is a private detective and Louise Monroe, who we met in the previous Brodie novel One Good Turn, is a police officer, and there is certainly plenty of crime involved, but in no way is this a traditional mystery. In fact, Jackson is only called upon to investigate a mystery until three-quarters of the way through the book, and Louise likewise. Moreover, neither of them really solves anything - if anything, most of the actual detective work is done by a resourceful but vulnerable orphaned teenage girl, Reggie. Reggie, whose mother is dead and whose brother is a drug-dealing sociopath, is a part-time nanny for Dr Joanna Hunter, and in the meantime, studying independently for her A-levels with the help of a retired teacher. Joanna Hunter, as a child, escaped a horrific death when she fled from the killer of her mother, sister and baby brother - and now that killer is about to be released from prison. In the meantime, a terrible train crash just outside Edinburgh kills and injures many - among them Jackson Brodie. So why, when he wakes up in hospital, are people calling him Andrew Decker? At around the same time, Joanna Hunter disappears with her baby son. Is her killer after her? Is she after her killer? Or does her disappearance have something to do with her shifty husband? 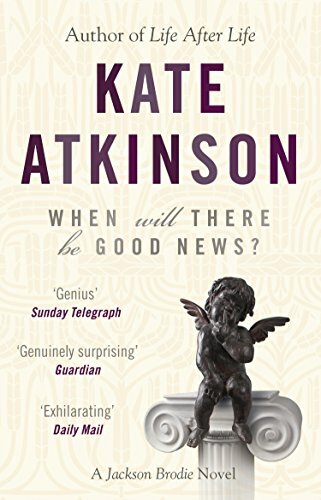 Like Atkinson's other books, When Will There Be Good News? has a plot and characters tied together largely by coincidence, misunderstanding and error. I know some people find this infuriating and unbelievable, but these really aren't supposed to be conventional crime novels. Atkinson's characters - Jackson more than any of them - continue to make terrible decisions and lead lives that are hapless, messy and confusing, full of random turns of fortune, much like real people do. In reality, mysteries are not neatly solved and then put away in a box with all loose ends tied, and people often do get away with murder. When Will There Be Good News? has moments of bleakness and moments of great humour - again, much like real life - and its characters are memorable and fascinating. There's only one more book in the series and it's already on my reading list.